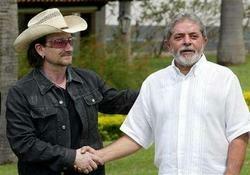 Bono had lunch with Brazilian President Luiz Inacio Lula da Silva on Monday. The two first met in Davos last year, where they discussed social and economic development in Brazil. On that occasion, the president himself requested Bono’s visit, and the U2 singer flew to Brasilia to meet the head of state. This time talked about the same subject, and Lula explained to Bono the details of a new program for unemployed farmers. After their meeting, Bono flew to Sao Paulo to prepare for U2’s Tuesday night’s show at Morumbi Stadium, which will be broadcasted live by Rede Globo. Bono’s schedule for the rest of U2’s South American tour is filled with political meetings. On Feb. 25th, the singer will meet with Michelle Bachelet, the new Chilean President, a very brave woman and human rights activist who survived Pinochet’s concentration camps on 1974. On March 1st, Bono will receive the distinction “Huesped de Honor de la Ciudad de Buenos Aires” from the Argentinean government, in recognition of his fight against poverty.